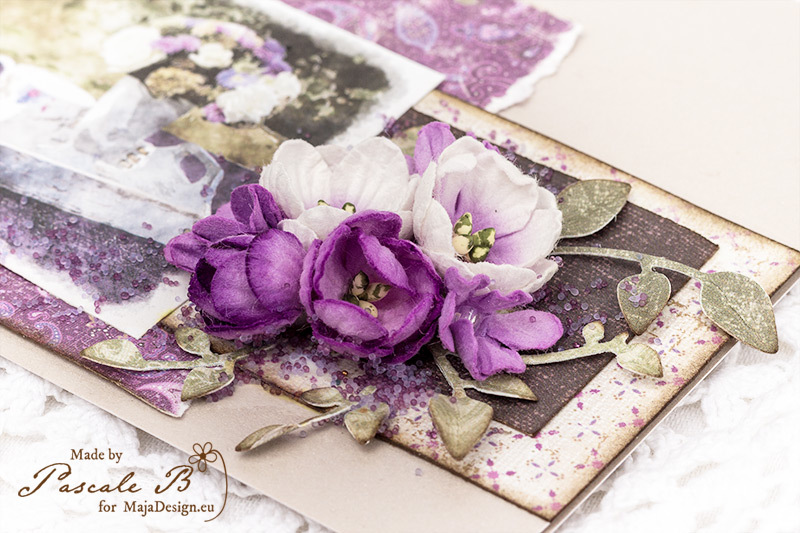 Today I’m up on Maja Design blog with a new set of cards featuring one of my favorite collection Enjoying Outdoors. Making cards is a good way to get rid of all the leftovers of papers you have accumulated over the past months or should I say years. I don’t know how you keep them, but I found that keeping them in a pocket with the collection is the best way to use them. When I was first starting scrapbooking I put all the leftovers together, but when I wanted one, well, I never found the right one! Now I know that if I don’t find it, it’s because I don’t have it and I will have to cut some beautiful paper! Let see how I made these cards! Even if both cards look different, the way I made them is the same. First, I chose in my leftover from the Enjoying Outdoors collection, which one I could use. When I didn’t find the right one, My next move is to look in the 6×6 paper pad. When I found all the scraps of paper I needed, I inked the edges to add some contrast before gluing them directly to the card base. I die cut some leaves in two green papers from the collection and I inked the edges. Then I added a few flowers. 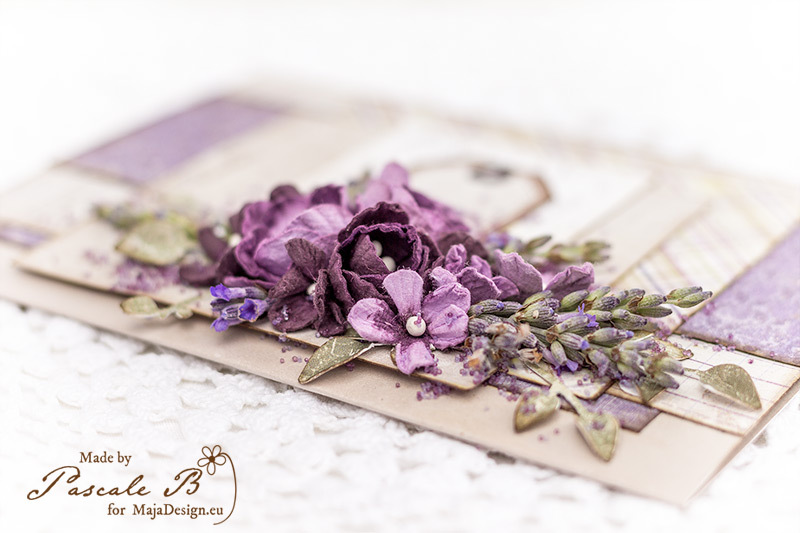 On this card, I even added some lavender sprigs from my garden. To prevent them from falling apart when they dried, I covered them with gel medium. And to finish the layout of the cards I added some microbeads. 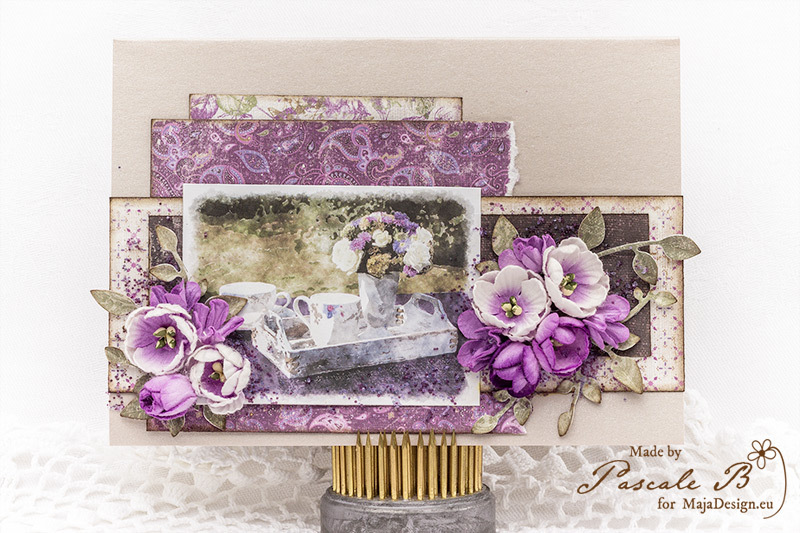 Tags: cards, Enjoying Outdoors, Pascale B. 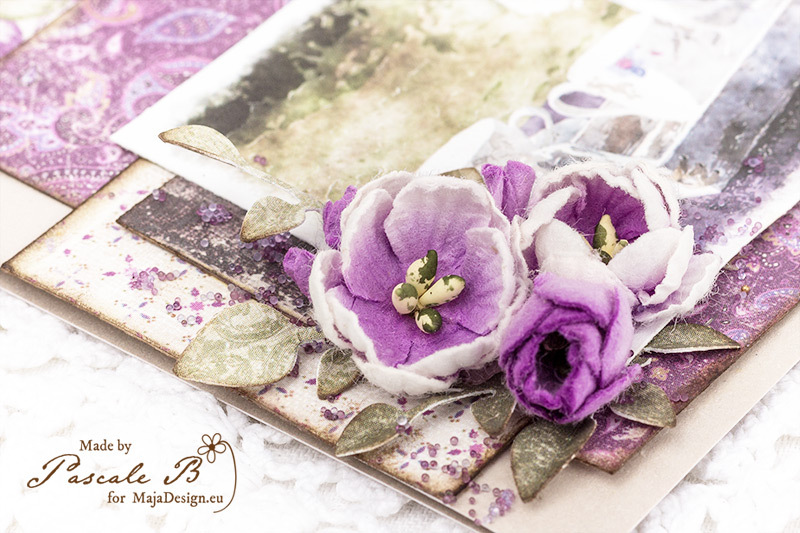 To create this album I used a ready base from Eco-Scrapbooking – a polish brand producing bases for cards, album etc. 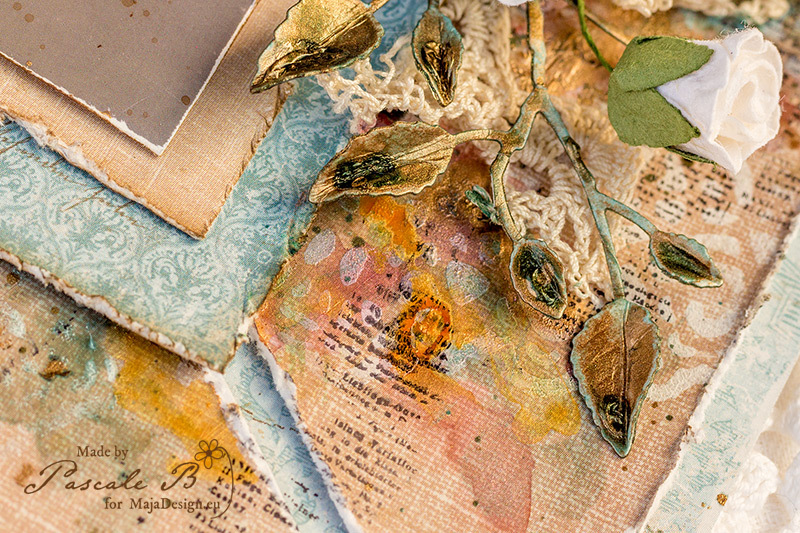 Inside pages are made from blue envelopes – they match perfectly with Maja Design papers! 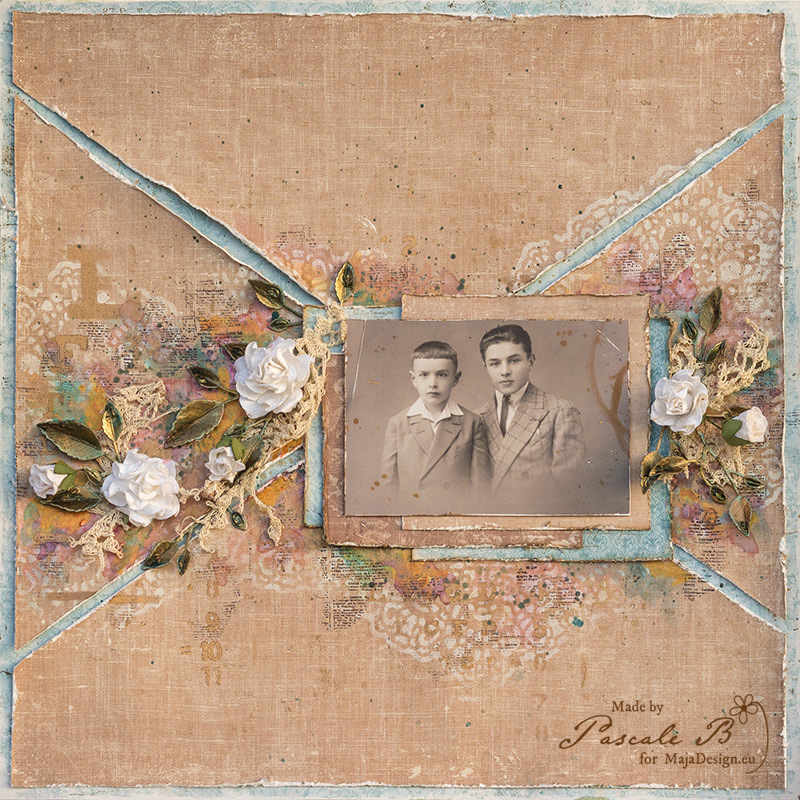 This time I used collections of Vintage Baby – I found there perfect papers for a boy, which I combined with the newest Monochromes collection. The main element on the cover it’s die cut from this collection. It is so useful when in a collection you have also some die cuts. It makes our work much easier and faster ! The next element it is a big chipboard frame from Scrapiniec. Some Petaloo flowers and ordinary roses, leafs and splashing. It is not too complicate but really impressive. Hello my dear friends and happy Sunday to all! 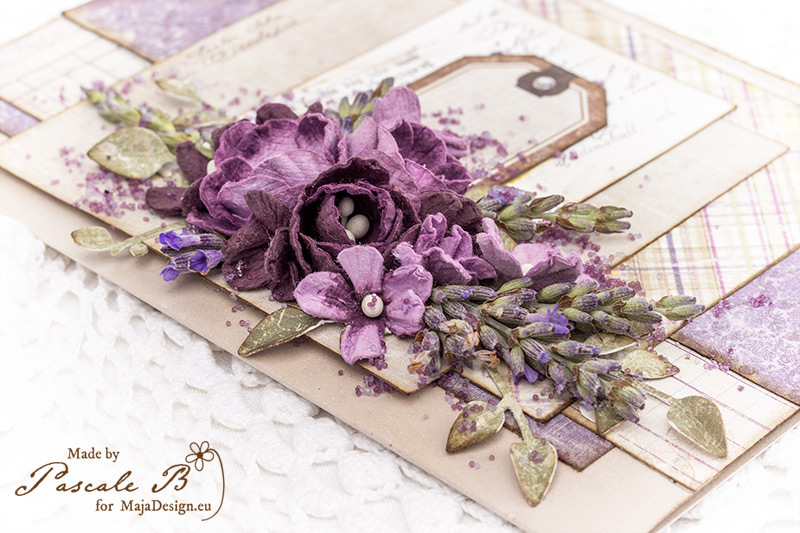 It’s Mary here with you today and I want to share with you my latest layout made with papers from the ”Enjoying Outdoors” collections. 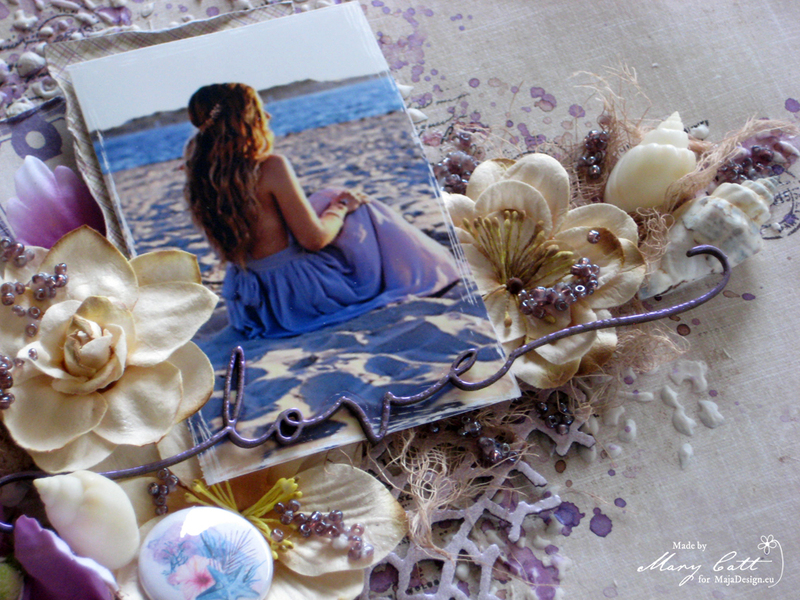 A soft romantic layout in purple and earth tones that was inspired by the beautiful photo which I found on Pinterest. And, before I continue I want to give all the proper credits to the ”unknown” photographer. 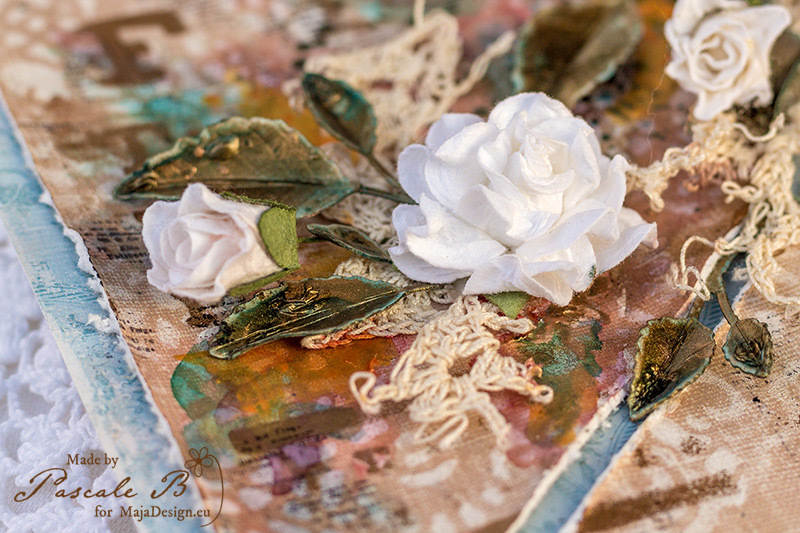 I used for my background the ”Flourishing” paper from the ”Enjoying Outdoors” collection. 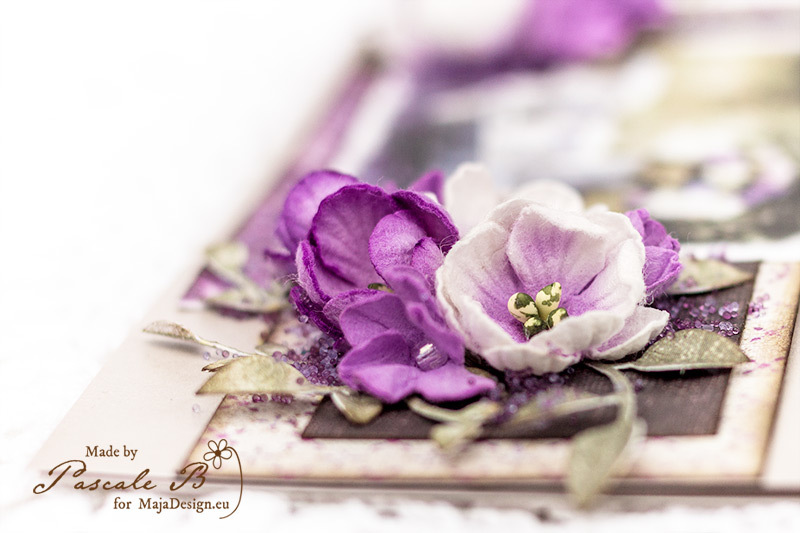 I also used some tags and a journaling card from the ”Tags & Journaling cards” paper to mat my photo. I primed my background with clear gesso and when it was dried, I added some texture with modeling paste and a stencil. Then, I colored my page using Lindy’s Stamp Gang sprays ”Tea Pot Purple” and ”Pegleg Pete Purple”. 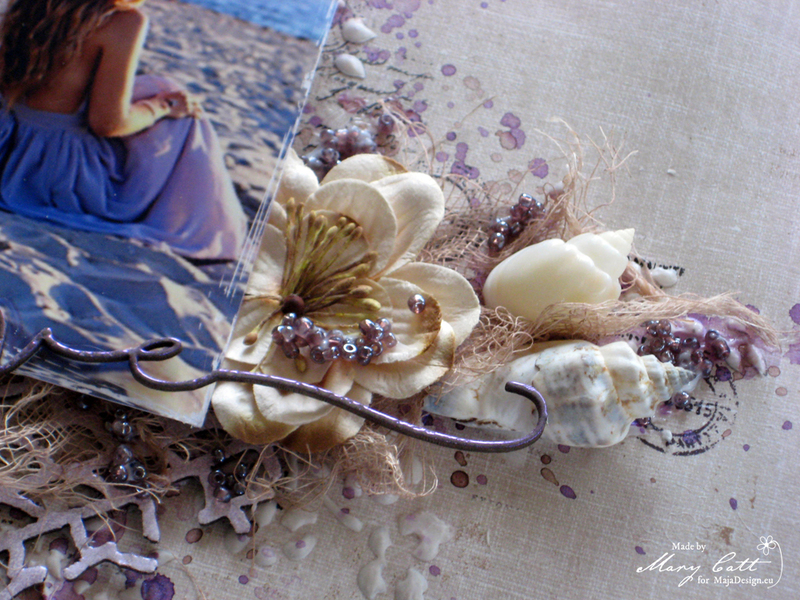 I heat embossed the ”Fishing Net Bit” chipboard with ”Pop Rock Purple” Lindy’s embossing powder. 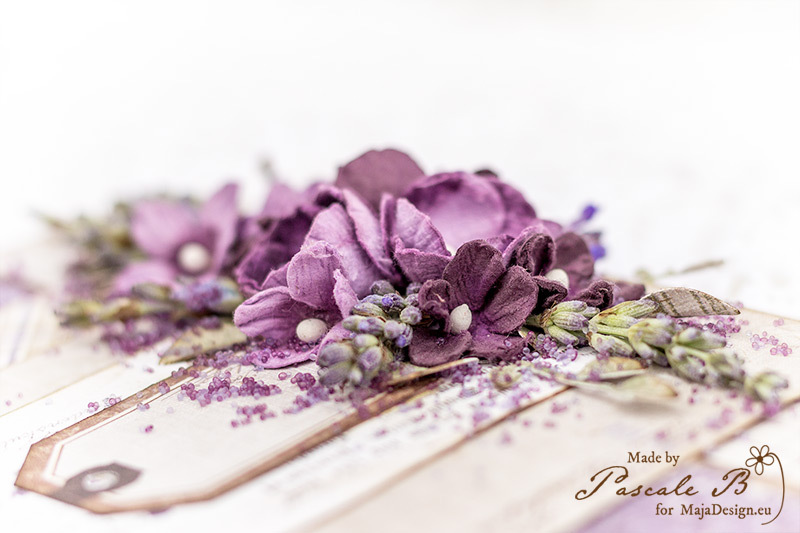 The title was also embossed with the ”Angel Wings Mauve” powder. 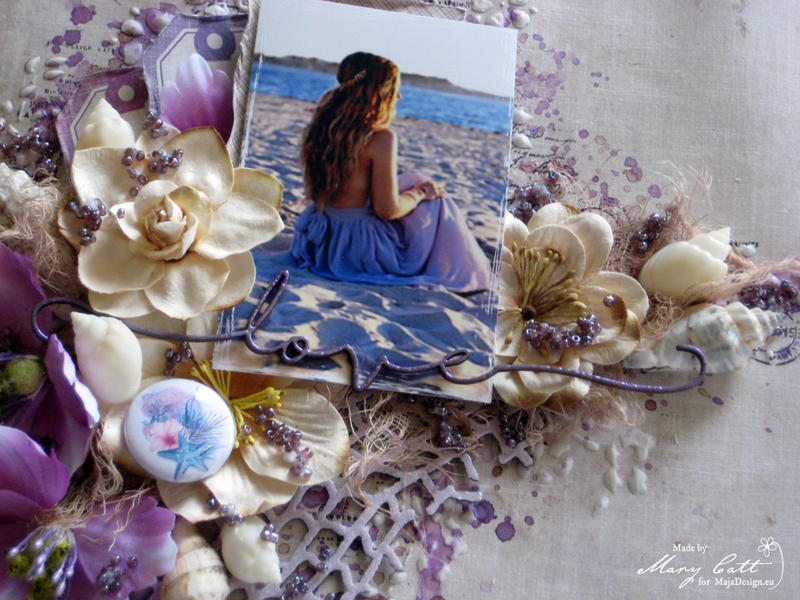 All the chipboards I used are 2crafty and the flowers and embellishments are Prima Marketing. The flair is from Cuts2luv. To finish my page, I added a few shells in my clusters and some licorice glass beads with gel medium. 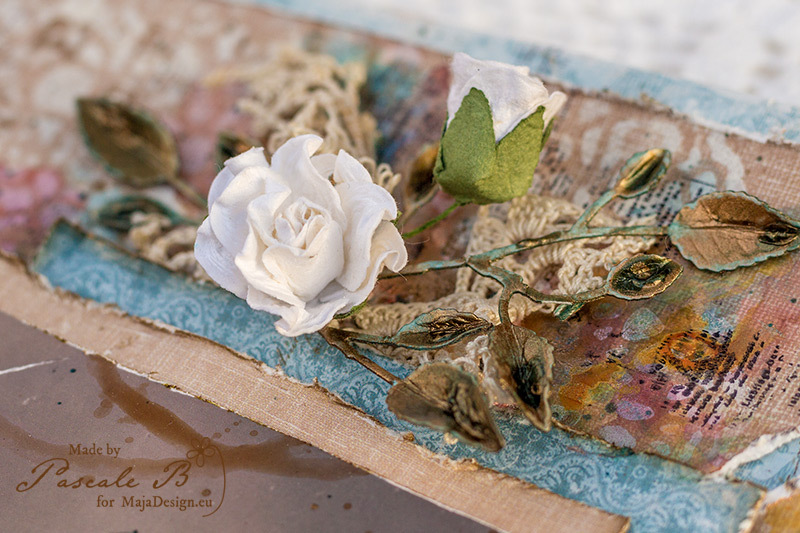 Today I’m up on Maja Design blog with a new layout. 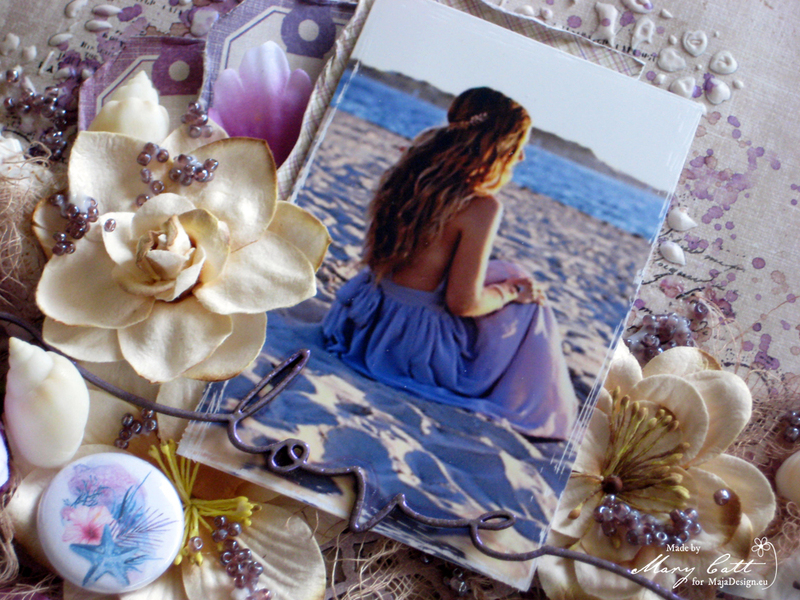 I used both the Enjoying Outdoors and the Vintage Romance collections. I chose a photo of my grandfather and his brother. I primed the background with clear gesso. 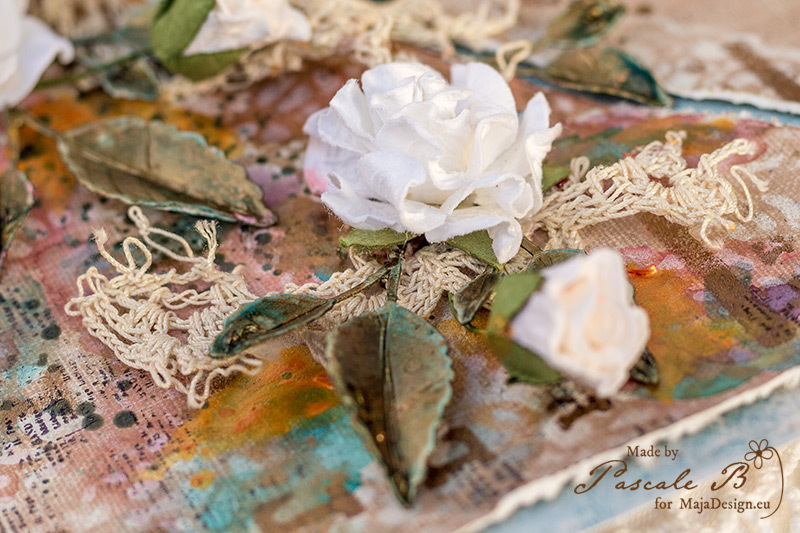 Then I added a design with a doily stencil and white gesso. When dry, I added a second design with another stencil and a metallic acrylic paint. Then I cut the background into four pieces and glued them on another paper. I cut a few papers from the 6×6 paper pack from both collections to add under the photo. I die cut some leaves in a watercolor paper and colored them with Glimmer Glam and acrylic paint. 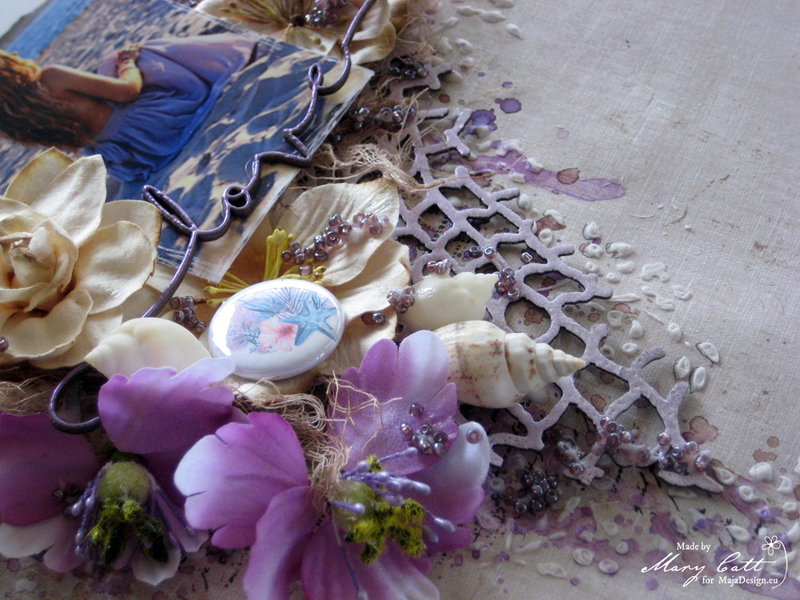 I added a few flowers as well as some doily’s pieces. When everything was in place, I added some colors with differents kind of paints. I finished the layout with some random stamping. Hello our blog fans. Today I would like to present funny cards created for Wedding. I like to make original, unusual cards for this occasion lately. 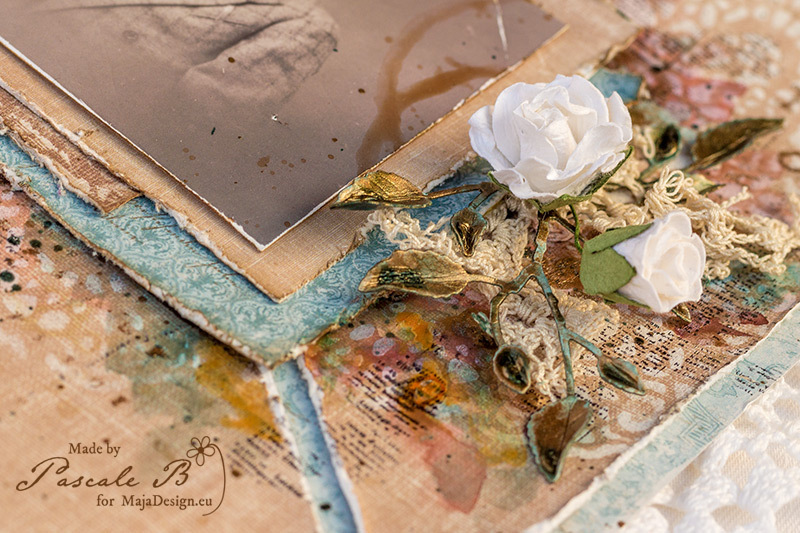 I love to combine different elements, use many layers of paper. I try to take care of all details and at the same take keep my project light 😉 Hope you like my project.